Born in Geneva, Switzerland, in 1962, Nassim Haramein from as early as nine years old was developing the basis for a unified hyperdimensional theory of matter and energy, which he eventually called the Holofractographic Universe theory. He has spent most of his life researching the fundamental geometry of hyperspace. Combining this knowledge with a keen observation of nature, he discovered a specific geometric array that is fundamental to creation. His unification theory, known as the Haramein–Rauscher Metric (a new solution to Einstein's field equations that incorporates torque and Coriolis effects), and his recent paper "The Schwarzschild Proton" lay down the basis of what could be a fundamental change in our current understandings of physics and consciousness. In the past 20 years, Mr Haramein has directed research teams of physicists, electrical engineers, mathematicians and otherscientists. He founded a non-profit organisation, The Resonance Project Foundation, where as Director of Research he continues exploring unification principles and their implications. The foundation is actively developing a research park in Hawai'i which combines science, sustainability and green technology. 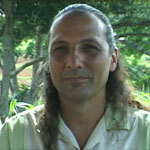 Nassim Haramein has been giving lectures and seminars on his theory for more than 10 years.